PLEASE NOTE. DUE TO WEATHER RELATED DAMAGE TO THE PRAIRIE CREEK PRESERVE ACCESS ROAD, THE HIKE WILL NOW BE HELD AT THE SECOND ENTRANCE TO HATHAWAY PARK ON WASHINGTON LOOP ROAD, 35461 Washington Loop Rd.Punta Gorda , FL 33950. SAME TIME. The Peace River Audubon Society will hold its first walkabout of the season with a night hike on Tuesday, October 3. This is the only night outing for the year and it meets at 7:30 pm in the Prairie Creek Preserve parking area. Walking will be minimal, but participants should bring insect repellent and dress appropriately. 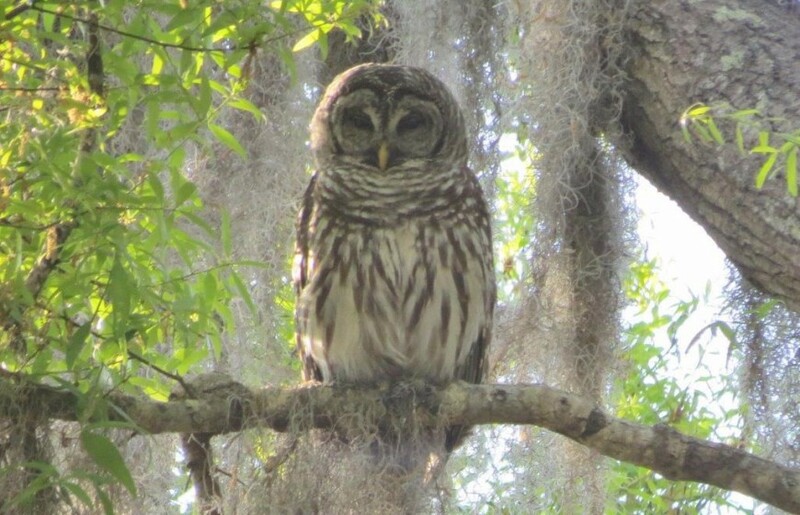 We will be calling for barred owls. So, it will also be important to bring a quiet attitude and keep flashlight use to a minimum. Prairie Creek Preserve is located northeast on US 17. Traveling from Punta Gorda, the entrance is on the right, just past the second Washington Loop Road intersection. For more information, contact Ron Mills at 941-575-6968 or rtmillsfl@embarqmail.com .